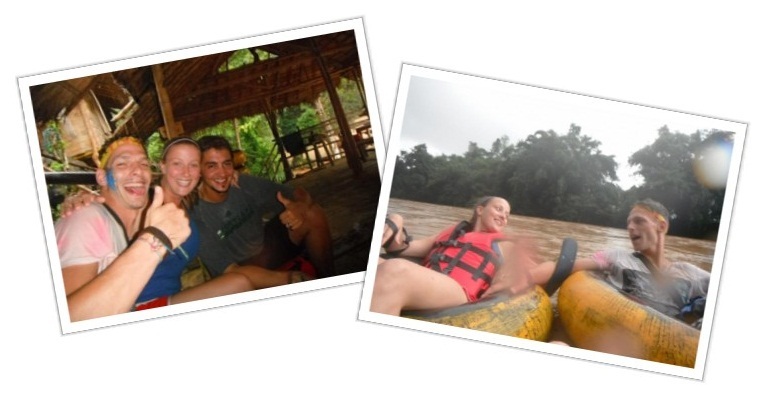 There is pretty much one reason that young travelers go to Vang Vieng, Laos: to tube down the Nam Song River. But would you hop into an inner tube and float down a river where nearly 30 people died last year? We arrived in Vang Vieng last week after an exhausting journey on four different buses. Our original plan was to spend a few days in Vientiane before heading north, but pretty much everyone on our mini-bus was enthusiastically headed to Vang Vieng for some tubing, and since we had already been on the road for 14 hours anyway, we decided to tag along. It wasn’t until we arrived in town and started doing some research that we realized just how fatal the activity can be. 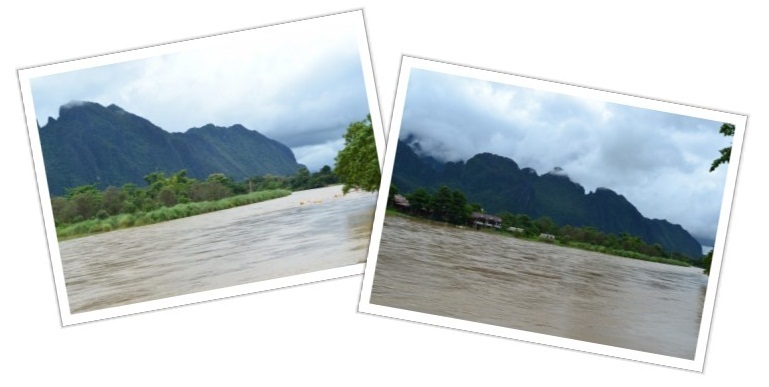 While any river can be dangerous, it’s the atmosphere in Vang Vieng that makes the Nam Song especially treacherous. The banks of the river are lined with float-up bars that indiscriminately hand out welcome shots of whisky and serve everything from beer to opium. After some deliberation, we decided to attempt floating the river the next morning, but with safety, not partying, as our first priority. By 11:00am the next day we were at the river’s edge with inner tubes in hand. 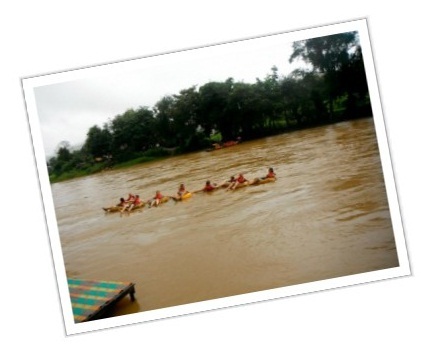 The summer is rainy season in Laos, and the mud-brown river was flowing quickly with water levels high. Needless to say, we were feeling a bit apprehensive. The tubing launch site was located at a bar on the opposite bank, and as we crossed over on a ferry we couldn’t help but wonder, “What the hell are we getting ourselves into?” To be honest, we did accept the free shot of whiskey for a bit of courage and set off down the river with our life jackets strapped tightly and a leash that we devised for keeping our tubes together. Once in the water and on our way, the tranquility of the scenery hit us. We had expected raging crowds and loud music, but what we found was a bit of solitude. In a lightly falling rain, we drifted alone along the base of tall stone cliffs. The lush vegetation and blanket of fog that covered the peaks made them appear to stretch on forever. The experience was completely different than what we had expected. Many of the bars along the river had not yet opened for the day, but we did stop at two. The families that ran both places were happily surprised to see us. Since we were the only ones on the river, we were able to spend some time talking with them. We learned that the mayhem starts daily at around 2:30pm and got a tip about the best bar to visit for a chilled out couple like us. Having survived one trip down the river and having seen the serene side of the Nam Song, we decided to return for a second run after lunch to see just how wild things get. At 3:00pm that afternoon, we were again standing across the river from the launch site, but this time with countless others ready to begin their first run of the day. Again we felt a bit uneasy, but for a completely different reason. As we looked upon the scene at the bar on the opposite bank, we witnessed sheer insanity. The tranquil wooden shack from that morning had been transformed into an all-out raging party. Blasting music, buckets of liquor, spray painted bodies, beer pong, chugging contests…you name it, it was probably happening there. As one sign read, “Anything is allowed.” The place was jam packed with people in their late teens and early 20s, some already nearing blackout status before even getting in the water. We quickly realized that we were among the few who were actually wearing life jackets. Some people were even sharing one inner tube between five or six people, barely managing to hang on as they jumped into the water. Keep in mind that there are no lifeguards, no rescue boats, no paramedics and only a very basic hospital in the town. It is said that the reasoning part of the brain doesn’t fully develop until around age 25; Vang Vieng may be the perfect place to prove this theory. At 26, we were amongst the oldest in the crowd. The idea of cutting people off at the river bars is non-existent. We could only stand to stay at the first place for one beer before deciding to take off and stay ahead of the drunken masses. Along the way, the debauchery continued and bars began to up the offering from alcohol to laughing gas, magic mushrooms and opium (for obvious reasons, we did not partake). The most inebriated became separated from their groups. It became ever clearer that the Nam Song River is not responsible for the high yearly death toll; extremely poor judgment is the real culprit. The further we separated ourselves from the crowds of annoyingly wasted backpackers, the more we enjoyed the experience. The last bar along the river is located on stilts high above the water and hidden around a bend. We reached it just as the skies opened up to a torrential rain and sat around a fire under the thatched roof, chatting with new friends and contemplated our great day of tubing. 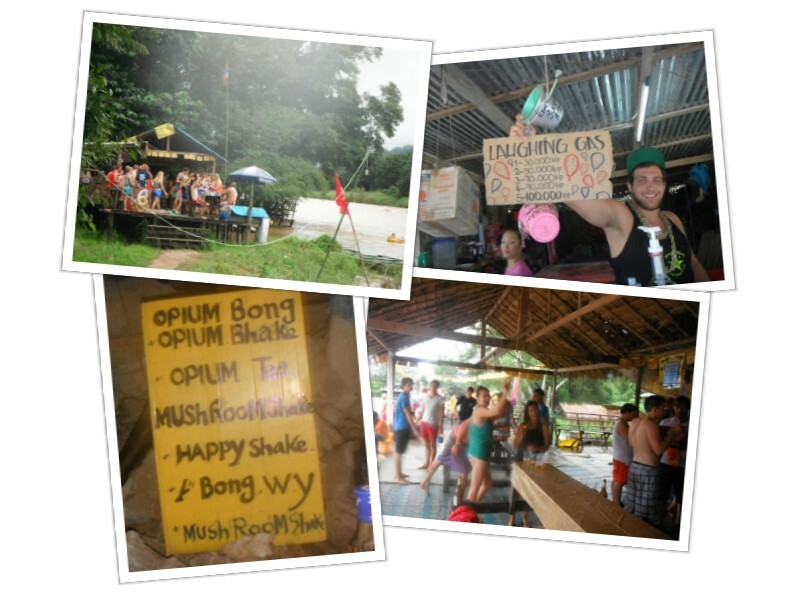 Although we thoroughly enjoyed our day on the river, Vang Vieng is sadly another example of tourism gone array. The city now depends on its tubing industry to survive, so despite the near 30 tourists deaths attributed to the river last year, the madness will continue. Any genuine Lao culture that the city once held has been obliterated. We are glad that we made our way down the Nam Song, glad that we had a good time, and glad that we did it in a reasonable manner. To tube, or not to tube? We say go for it, but remember that only you are responsible for your own safety. I’ve been in Vang Vieng a couple of years ago. Having seen the madness on the river my choice was definitely not to tube. The whole thing has massive negative consequences for the local nature, culture and health and is just ridiculous. Instead of mindless drinking, I spent a few days volunteering at the Mulberry farm, giving English lessons to local kids (who by the way are disgusted by the naked masses floating down the river). The people at the farm actually encourage guests to write letters to the government asking to ban the tubing scene alltogether. Don’t tube! Michael, Thank you for your comment. We write to share our experiences and appreciate hearing back from readers. We definitely agree that the many backpackers have turned a fun activity into something with far reaching negative effects. We hope that our blog will help people choose to act more responsibly. Also, we absolutely should have included an 8th tip. Respect Buddhist beliefs regarding revealing skin. Wearing tank tops, bikinis, “booty” shorts or going shirtless is very disrespectful, as is being drunk and disorderly in town. While we are not experts on the matter, the whole tubing business seems to be a Catch-22. If the community chose to ban it, we would fully support that. Unfortunately, the community has little to say on the matter – the big bosses decide, and the little people suffer. The big shots are, however, sensitive to outside criticism, and I believe travellers can and should take some responsibility on the issue. I am sorry for the perhaps harsh tone of the comment, but Vang Vieng was about the most inappropriate thing I saw during my travels and it left a lasting impression on me. Hmm sounds like an interesting debate…I imagine you’ve been to a lot of places where some of those tradeoffs are put into the forefront. I’m glad you guys were able to enjoy it because you look pretty happy in your thumbs up pic! Things are not always what they seem. Glad that you investigated the situation which led to a fantastic experience. With age comes wisdom, 26 is a great age!